The classroom — one teacher, one group of students, usually of the same age, one rectangular space, door closed — is the great survivor of schooling. It is now as it has been for two or three centuries the main arena of the encounter between teacher and taught, and the taken-for-granted stem cell of schooling as it metastised from cottage to global enterprise. 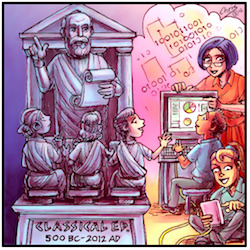 The pre-eminent chronicler of the classroom, United States historian Larry Cuban, has depicted the history of the classroom as a contest between 'teacher-centred' and 'student-centred' pedagogies. In the foundational form of the classroom, rows of desks faced the front where, on a raised platform, standing before a blackboard, a single adult talked, told, and controlled dozens of students who sat up straight and listened, recited, copied and remembered their way through one 30-minute 'lesson' after another. But this form has long been under assault from 'progressivism' and its disruptive ideas about how to organise space, students, time and activities to produce 'active' and 'creative' learning driven by 'student needs and interests'. The contest between the old and the new, Cuban argues, has been settled decisively in favour of the established order. As a stroll down any school corridor will reveal, 'student-centred' teaching and learning have steadily gained ground, particularly in the earlier years of schooling, but even there it has been absorbed into a 'hybridised' but clearly teacher-dominated classroom order. There is little evidence to suggest that things have played out differently in Australia. Here as in the United States a crazy-brave rebellion in the 1970s in support of the 'open classroom' and its team-taught, flexibly-grouped, activity-based learning was effortlessly defeated. A former colleague conducted a national evaluation of the open classroom, and could tell some very funny stories about the ingenuity with which teachers used pot plants, book-cases, office partitions, stacks of cartons, anything to turn open classrooms back into closed ones. Twenty years later another incursion came from a different direction but suffered the same fate. In the early 1990s the National Project on the Quality of Teaching and Learning (NPQTL) set out to encourage different ways of organising the work of students and teachers, but soon disappeared without trace. The classroom is a jealous god. But does it have another century or two left in it? The classroom is facing a combination of pressures which might force it to cede more ground, perhaps even lose its place as the dominant life form, in at least some areas of schooling. First and most familiar is the pressure of what and how teachers want students to learn. Teachers have been the apostles of progressivism, often against the opposition of parents and editorialists. Now more than ever they want students to 'take responsibility for their own learning', to 'learn how to learn'. Teachers know that as early as Year 3, a single class will include some students who are five learning years ahead of others. They want to organise learning that stretches all of them, the fastest, the slowest, and the in-between. For many years teachers believed that they could do it if only they weren't trying to cope with so many kids. On my first day of teaching in February 1964 I faced 40 students, a special dispensation because I was first year out. The old hands had 50-odd. Teacher militancy in the 1960s led to tumbling class sizes in the 1970s and 1980s, and for a time it seemed to work. As classrooms became less crowded so did they become less formal and more varied in their organisation of furniture, student groups, time and activity. But change in both quantity and quality has been arrested by two realities. First, even 20 students constitute a crowd. Chaos always threatens, and only one person stands between order and chaos. That is why the social order of the classroom has not been fundamentally changed. A gathering body of evidence suggests that it will stay that way unless and until the student group shrinks to as few as eight, perhaps ten at a pinch. Halving class sizes was expensive. Halving them again is prohibitive. The central reform strategy of half a century has reached its terminus without delivering the kind of learning and teaching that teachers want. But that hasn't stopped them wanting it. A third pressure on practice comes from the theory of reform. At the risk of suggesting neatness and sequence where it is often hard to find either, 'reform' in the 1950s and 1960s meant more — more teachers, more classrooms, more schools. Then it meant changing 'the system', through devolution, regionalisation, and restructuring hierarchies of control. As teacher scepticism about these changes deepened into cynicism, the attention of reformers shifted from the system to the school. 'School improvement' and then 'school effectiveness' were all the go. The last of these grew up as an effort to understand how so much time, money and effort could be spent with so little apparent improvement in student learning. The trail led, at last, to the classroom door. As researchers peered inside the most obvious thing was the difference between teachers. A very effective teacher, they calculated, makes three or four times as much difference as a very effective school. The question now on the agenda is whether the grail will be found in somehow producing more and more highly effective teachers, or in changing a workplace that functions well only in the hands of a maestro. Until recently the question might have been hypothetical. The demise of the open classroom and then the NPQTL demonstrated that even if the classroom didn't let teachers teach as they felt they should, there was no alternative. The fourth pressure on the classroom is that an alternative may be just around the corner. I refer, of course, to emerging information and communications technologies. Schools have been fiddling with computers for decades, but computers have so far gone the way of numberless other innovations, absorbed by and pushed to the margins of the dominant order. In other words, they haven't delivered. But, they will — or perhaps I should say, they will be able to. There already exists a good deal of software that helps students learn at their own pace in a thoroughly engaging and productive way. But the big gains will come from the management of learning rather than, or as well as, its conduct. 'Expert systems' combined with the 'soft' technology of standards- or outcomes-based curriculum will be able to assess or record assessments of where each student is up to in each area of learning, figure out the best next step, summon up ways and means of taking it, and monitor progress toward a clearly-defined and amply-illustrated objective. Expert systems will open up the private world of the classroom and make possible a different allocation of the labour of learning. Students, both individually and in varying combinations, will be able to take over from teachers some management of the teaching and learning process, as will other adults including parents, support staff, and trainee and intern teachers. Teachers will spend more of their time in expert diagnosis, prescription, planning and supervision. At this early stage it seems likely that emerging technologies will also free up resources needed to construct a different division of labour. There are already entirely 'virtual' secondary schools in the US as well as schools that 'blend' virtual and real-world schooling, each with cost structures very different from those of the classroom-based school. The productivity problem of schooling may find a solution long-familiar elsewhere. Perhaps all this can be done within the familiar circumstance of the class, the teacher, and the classroom, but technology-rich learning and learning management may be better served in spaces that look and feel more like a workshop or studio than a chapel or a factory. 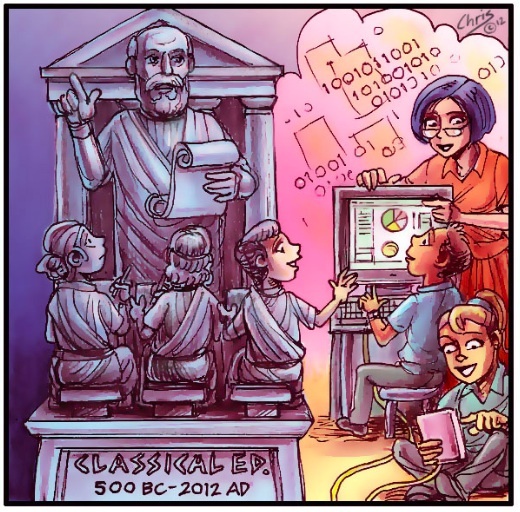 In any foreseeable or desirable future there will be a place for the class and its teacher, but it will be shared with many other combinations of students and adults, time and space, brains and machines. Where and when these fundamentally different forms will emerge is hard to predict. The class and the classroom are heavily defended, by the physical shape of schools, by how students and teachers are used to behaving and interacting with each other, and by a cat's cradle of regulations and industrial agreements. It is possible that what exists will cause what could be to arrive last in those schools where the need is greatest. Dean Ashenden was co-founder of the Good Universities Guides and the Good Schools Guides, and has been an adviser or consultant on education policy to state and federal governments and agencies. It is all well and good to propose a software that may enhance education but such idealised systems will not also be without their drawbacks. What of student motivators? You speak of students who are supposedly willing to learn. Perhaps a little naive to presume such a massive factor. Perhaps this magical software will also change a persons intrinsic motivations. Please provide some form of step forward instead of propagating and pontificating on an issue that is stuck in a cyclic turmoil. There is always going to be 'the next great solution' to a problem. When the problem is the question then the answers will never suffice. Stop trying or try harder. Ashenden is right that "In any foreseeable or desirable future there will be a place for the class and its teacher, but it will be shared with many other combinations of students and adults, time and space, brains and machines." I have run a largely teacher-centred almost totally electronic classroom for the last 6 years. All marked work is requested to be completed and delivered electronically. But you'd be amazed at the number of low socio-economic kids who refuse to bring their Government supplied laptops - and at the older teachers who try to simply ignore the existence of computers at all. But classroom teaching has always been as much about child-minding and socialization as about learning. The only sensible thing I've heard about the classroom in all that time is that "teaching is a relationship". It often has been a relationship (usually a bad one) with an entire class. It becomes more important, however, when it is a "relationship" (and not an inappropriate one!) with a single student who (usually for some inexplicable reason) the teacher is able to 'reach'. The experience of myself and my own three children is that 'good' teaching is an extremely varied and complex thing. Often the best teachers are the truly dreadful and hopeless ones because they force a motivated student to do almost the whole course on their own and hence learn it all themselves - thus truly 'learning how to learn'. My own least academic child, however, mostly only stays in school because of one teacher she simply really likes. The other two are so academic they could have probably learnt effectively inside a black box and obviously didn't need a classroom at all. Admittedly, they've got lots of home support as both their parents have doctorates, vast paper library and lost of electronic devices. Now that I'm retired, however, I'm of the view that a motivated kid would learn a lot more (and a lot more efficiently) by simply staying home an listening to whatever interested them on ABC Radio National and ABC Classic FM - and doing a few varied 'assignments' their parents have negotiated with them in return for the privilege of not having to attend school regularly. They'd probably still want to go to school occasionally to catch up with their friends or to enjoy the walk along the beach in order to get there. Sadly, however, the only sensible book about education that I've re-read in my retirement is Ivan Illich's Deschooling Society (1971). I bought it about 1975 and if I'd read it more carefully back then I think I would never ever have set foot in a school. Despite that, I guess (that like most teachers) I touched a few lives along the way (but usually only accidentally). But the one thing that a lifetime of State High School teaching has taught me is that even the most appalling teachers still manage to reach (and sometimes occasionally inspire) at least one or two children in their careers. Teaching is thus a lot like marriage it seems to me. About half fail, many stagger on staying together for the 'sake of the children' and there are only a handful which remain mutually happy and reciprocally satisfying while allowing each individual to grow and learn. But I nonetheless still suspect Ivan Illich was right - and that "DIVORCE' (at least in the 'schooling' context of our very technological 21st century) is probably the best, cheapest and most efficient option for educating our young. It's going to be hard on those who don't have affluent, supportive and academically interested parents - but then compulsory State Schooling doesn't seem to do very much for those who don't have these things currently. There are exceptions, of course - but I personally only encountered about ten such students in 30 years of what was sometimes simply 'yelling at kids for a living' - rather introducing sensitive individuals to knew worlds of which they never once could have imagined. Tragically, I expect that 'education' in the 21st Century in Australia will be business as usual - child minding for the masses and some limited social mobility for the few at the margins. You're a hard marker Stan! The argument is that (1) teachers and students are currently working in a set-up that often doesn't and can't motivate except in the hands of a really outstanding practitioner; and (2) software is no magic bullet but may supply one of several components to a better (more motivating) relationship between teacher and taught, student and task. Wonderful article. This places many of the competing arguments in perspective. Why is there so little intelligent debate in the public press about this issue? Testing, better teachers, choice, more funding for public schools. It is always polarized and narrow. Crikey! I need to go back to school to be able to understand all this. Surely the main effect of technology on schools should be that they change from teaching facts to teaching skills. For facts, there is Wikipedia, a much better tool now than when it first appeared. Skills are a different thing. Remember when you used to write an essay every few weeks and it was actually marked in red by your teacher, marked for grammar and spelling and punctuation. But no one writes essays any more, you say. Ok, forget essays and teach students how to write correct English: just correct English, good English will come later. Teach those who will need it how to do calculus, how to derive and understand statistics, how to titrate, how to speak to locals in France or China, how to use an adze or a drill or a saw; teach them about the business cycle and the structure of the universe and the insides of the atom. Teach them life skills. The authorities in some states are in dispute with teacher unions because everyone and his aunt knows that there are inefficient teachers and it is the job of unions to defend them at all costs. The authorities hope that by passing the buck to the Heads this may improve standards as it does, to some extent, in private schools. Thank you, Dean Ashenden, for the five line comment above addressed to Stan. Now I get it and will not need to return to school! Thank you Dean; it is really important that Australia has grown-up conversations about schooling, and its problems.These problems are mainly social and not educational, and too neurotically embarrassing for us to come clean about. It seems to me as an informed outsider, that a fundamental problem at the moment is that there are too many children from incompetent families who are not yet socialised enough to be able to learn. Then there are too many teachers who have given up because trying to teach these children is just too hard...indeed by definition it is impossible; it just destroys the classroom as a learning environment whatever the mode of delivery. The answer HAS to involve taking these unfortunate children out of the regular classroom and doing what ever it takes for as long it takes to coach them in how to relate normally to others; without this they will stay unschooled and unemployable. This is all terrible politically incorrect...but it has to happen, or anyone that can will continue to put their children into private schools where learning can more easily occur without this quite large sociopathic element. Let`s get real! The open classroom may have been “effortlessly defeated” 30 years ago, but it has raised its ugly head again under the guise of “flexible learning spaces”, which get a run in puff pieces in The Age every few months. It’s as if a group of hippies has been hiding out in education and architecture for the past 30 years and has now resurfaced with the usual jargon. There are 500,000 studies that show student learn more when they are actually taught. Instead we have conscripted groups of teachers forced together, with little regard for subject expertise, to “facilitate” large groups of students (200 in the one area at my last school) in enquiry-based projects. The “flexible learning spaces” will go the way of the open classroom. It’s a pity that so many students and teachers will suffer in them until their demise. Eugene's comment has much truth in it. Many schools in disadvantaged city and rural and regional areas struggle to address the social inequities of their constituency. A significant proportion of children come from one-parent families, a smaller proportion come from families where custody disputes are ongoing, and an even smaller proportion come from families where neglect and abuse occur. So these factors are of importance before the teacher becomes involved. Managing a classroom is complex and calls for skills not only imparted in a University lecture room, but, even more importantly, learnt in 'on the job' training. Technology has become increasingly important but cannot replace the human contact so necessary for children of all abilities. But most especially for those children struggling with issues on the home front. Why don't the teaching colleges promote evidence based teaching practices. If it is good enough for doctors why not for teaching..
For example, teaching colleges promote such things as learning styles; ;the whole language method of teaching reading; the constructivist teaching strategies. All these have little or no evidence for their efficacy. Explicit instruction is ranked by Hattie , as one one of the most effective teaching strategies but it is shunned by the "constructivist" mindset of certain academics. Experts are experts, in any field, because they practice or use their particular skills on a regular basis. For example, virituoso violinists practice more than "good" violinists as Willingham shows. He also says that to think creatively one must have a lot of facts or skills in one's "filing"system. It is not so much about rote learning but about having a lot of data and skills and being able to apply such data and skills to new situations. To teach effectively especially to struggling students, why aren't the trainee teachers taught the requisite skills based on solid empirical research. Teacher colleges are short changing the trainee teachers and ultimately the struggling students that they have to teach. I am not a teacher but was involved in Religous Education in the early 1970.s. Then the earlier concepts of "indoctrination" had been adandoned in favour of a more philosophical position of letting children look at "Life Issues' in a Christian context. It seems that modern secular education has abandoned history or any form of philosophical discussion. Todays children as well as adults face the Media dominated by politicians and other pressure groups selling propaganda based on distorted facts. Fundamentalist Christians follow the same line. young people should be enabled to use the Internet sensibly and be able to discern what is authentic scholarship and what is "Spin". Thanks Dean for this wide ranging discussion thus setting the parameters for a decent, ongoing discussion. Educational fads come and go and so do governments and like most big issues (those that count) education suffers at the hands of incompetent governments absorbed in dogooder mentalities which do not listen to school communities. Was the digital revolution a stunt and what long lasting effects will it have? At best it seems that it has saved school budgets more than necessarily enhanced learning. How many students use their government provided laptops? Many students have forsaken email for social networking yet schools feel they have accomplished a lot by providing students with email. Whatever the vagaries of governments or educational trends, the relationship of teacher and student remains core. How many of us remember our teachers more than what they taught? The contemporary teacher is thrust into a whirlpool of rhetoric coming from all sides, the media, governments, parents, unions and just about anybody who has an opinion. Breaking through this morass is a balancing act. Keeping the faith (in the teacher student relationship) is one ongoing commitment to getting the job done for the sake of our students. Stan Ditnomore can you please do something! You truly do have all the answers! Society is in denial about all this!